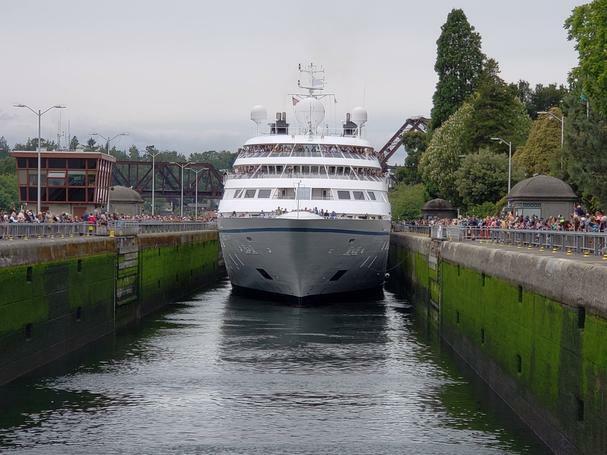 The tag-line for Windstar Cruises is: “No one else goes so far to get travelers so close…” Recently in Seattle, the boutique cruise line sent its Star Legend through the Hiram M. Chittenden Ballard Locks, which connects Lakes Washington and Union to Puget Sound, making it the largest ship to ever pass through the locks. With just 6 feet of clearance on each side of the ship, we all got a very close up look of the locks! Our day-long adventure on the Star Legend was memorable in many other ways. Windstar Cruise Line is the official cruise line of the James Beard Foundation, so for those who enjoy excellent food with their travel, this is the line to choose. Windstar works with the foundation to bring together world-class chefs and sommeliers to provide unique culinary experiences to guests. 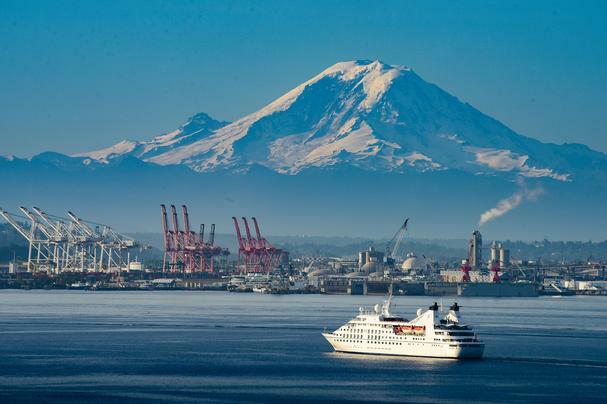 The cruise line picks from among their arsenal of award-winning chefs, those who can offer a focus on cruise-specific regional cuisine and locally sourced ingredients. The guest chef for the day was Renee Erickson, the 2016 winner of the James Beard Award for Best Chef Northwest. Erickson is the owner and chef for a group of restaurants around Seattle, including Bar Melusine, Bateau, Boat Street Cafe, The Whale Wins, Barnacle, and The Walrus and the Carpenter. As soon as we stepped aboard the ship, we discovered why Chef Erickson is considered such a rock star. Climbing to the top deck of the ship, we discovered a spread of hor 'd oeuvres featuring a true Seattle flavor. The scallop tartare, with yuzu kosho, and pickled garlic scapes was refreshing and delicious. And came with a kick! 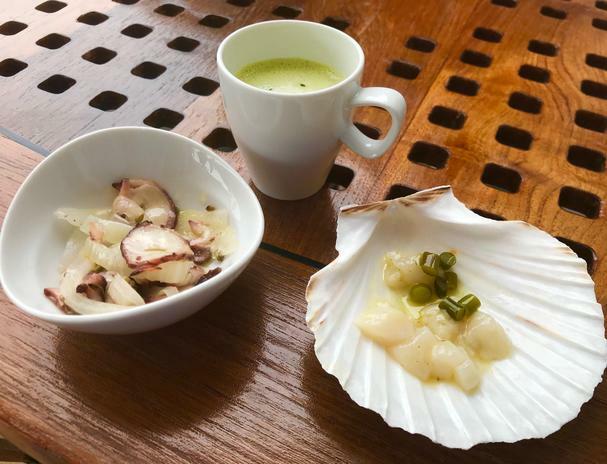 The delicate flavor of the scallops was set off beautifully by the distinctive salty-spicy-citrusy punch of the yuzu kosho – a Japanese condiment made of fresh chilies which are fermented with the zest and juice of the yuzu – a tart and fragrant citrus fruit that grows in East Asia. Another highly popular item was the octopus, marinated in fennel seed, red onion, radish, and butter. Both dishes paired very well with the citrus notes of the Natura Sauvignon Blanc that was served. 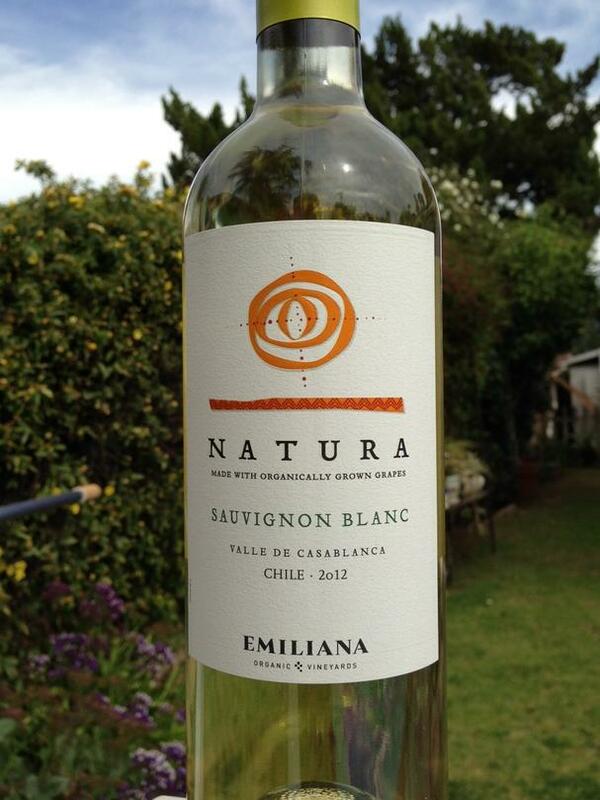 Natura Wines is one of the premier organic and gluten-free wines from Chile. The Sauvignon Blanc has a very complex and layered nose of lime, grapefruit, and herbs. The fresh, bright acidity of the wine is especially good with the spiciness of the delicacies we were enjoying. The Star Legend is an all-suite yacht, with a capacity for 212 guests. Each of the 106 suites has an expansive ocean view, queen size bed, walk-in closet and full-size tub and shower. You might be tempted to spend all your time in that beautiful suite – but then you would miss the elegant lounges, club areas, libraries, fitness center, and spa. We set up “camp” for the day in the Yacht Club lounge, a gorgeous and comfy room, with wrap around windows in the foredeck of the top deck. Soon it was time to find the AmphorA Restaurant for lunch. We were delighted to see it served as a buffet – no need to stress out about choices! The highlights were the Alaskan poached sockeye salmon, flaky and flavorful, and the pan-fried red deer venison sausage. As we neared the locks, we risked missing some of the excitement so we could get an extra helping (or two) of the venison! Luckily though, you just don’t take a cruise ship through the locks at high speed, so there was plenty of time for full enjoyment of the trifecta!